Tang Yi’s speaking made others instantly come to an understanding. Though the Seeking-Tao Mirror was quite rare, some wealthy and powerful families were able to get their hands on it. Right now, Huo Yuan had already come to the mirror and stopped. And just like his words, the mists on the mirror surface rolled violently after a short stagnation. Following Xiao YiShu’s voice, Huo Yuan walked to the other side with arrogant strides. He had already passed two tests. That meant he would at least be an outer disciple of the Seeking-Tao Sect. Seeing such a successful example, others were itching to try. They stepped towards those five Seeking-Tao Mirrors in succession. Though there were so many people, the Seeking-Tao Mirrors had a swift response. Basically, the mists on its surface presented in an active or idle state as soon as a person standing in front of it. Jiang Yun was in the line. Watching others’ joy or sorrow, he was quite nervous. The one before him caused the mists curled successfully. And it was Jiang Yun’s turn now. Taking a long breath quietly, Jiang Yun stood in front of the Seeking-Tao Mirror. And then another unexpected accident occurred! The moment Jiang Yun was standing in front of the mirror, the Seeking-Tao Mirror exploded with a large noise! And Jiang Yun who right stood there was thrown through the air and flew backward due to the huge force impact. This sudden accident made all the people silent. One could even hear a pin dropping! All the people started looking at Jiang Yun who fell hard after the mirror problem as if he was a freak. You could regard an unexpected thing as an accident for the first time; however, you could not do it twice. There had never been one who caused the Seeking-Tao Mirror to burst just because he was standing in front of it. The fact was that, though everything in the world had the Heart of Tao, not everyone could converge the Spirituality of Tao; and if you couldn’t converge the Tao Spirituality, the only thing could happen was that the mists on the Seeking-Tao Mirror’s surface stayed still. If everyone who was unable to converge the Tao Spirituality made the Seeking-Tao Mirror exploded, then every sect needed to prepare thousands of the Seeking-Tao Mirror on its recruitment day. Jiang Yun on the ground was confused as well. He had a keen sense that there were at least five or six sights falling on him from the sky. They scanned his entire body inside and out carefully! Finally, feeling that these eyes were not kept on him any longer, Jiang Yun took a breath softly. He then looked down at that triangular black stone which was hung on his chest! Because when he had stood in front of the Seeking-Tao Mirror, he had found that there seemed to be a dim light crossing the stone quickly. After that, the explosion happened. But now it looked normal, with no light on it. Jiang Yun was a little confused. Maybe he had gotten a blurred vision at that time? At the same time, after a dead silent, people came to their senses and started discussions now. Though Huo Yuan was joking, many people actually believed it as a possibility. Apparently, Xiao YiShu didn’t know how to deal with Jiang Yun’s continuous incidents. Though one mirror was destroyed, he knew that Jiang Yun didn’t mean to. Hence, he couldn’t ask for compensation. He could only wait and see what would happen next. Jiang Yun stood up quietly and stepped out of the square. Jiang Yun looked like he didn’t care about Huo Yuan’s words. But in fact, his heart had sunk to the bottom. Because he had been reminded of what his grandpa had told him for several times, that he wasn’t the one of Jiang clan and as a result, he was unable to cultivate Tao in the Jiang way. At this moment, Jiang Yun felt that maybe his grandpa had cheated him! The real reason that he asked him to come to the Seeking-Tao Sect should be to protect him from the threat of Feng WuJi and Feng village! Thinking of this, Jiang Yun suddenly felt downhearted. He almost wanted to leave for the One Hundred Thousand Mang Mountains as soon as possible. 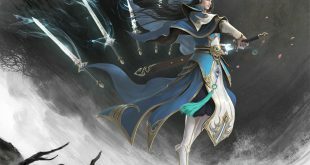 However, thinking of the life-or-death covenant with Feng WuJi and his mysterious life story, Jiang Yun finally gritted his teeth; there was still the last test, and he at least had the last chance. At this moment, a kind of hoarse voice sounded right near his ear suddenly. Jiang Yun was shocked. Following the sound, he found a young man somehow appeared around him with no noise. Such a speech shocked Jiang Yun. How come did the man speak like this?! Jiang Yun was moved. He wanted to ask something more. However, it was announced that the second test ended. This time only about seventy people passed successfully. And only seven persons who had already kept passing two tests! Jiang Yun was slightly cheered up. Although he had no idea what the Physique of Tao was, he guessed it should be relevant to one’s physique. He knew that he didn’t have the Tao Heart and couldn’t converge the Tao Spirituality. But his body was very strong. He should be possible to pass the last test.